Finalist in the San Diego Book Awards, 2014, and in the Global eBook Awards, 2104, this enhanced version of the novel by E. Z. Graves contains cool videos, a zombie music playlist, and a lot of zombie killing. 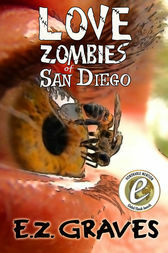 San Diego have become infested with a strange breed of "zombee," and the Love Zombies are out to make a name for themselves. Led by Josh, this gang of mutant humans--not quite homo sapien and not quite zomie--joins with some breather teens in La Jolla to take on the plague.